Fred, (The Great Waldo): Whoopee! Fred, (The Great Waldo): Thank you, folks. Thank you. First off, I must be honest and tell you that I am not a huge fan of musicals. Sure, I have enjoyed films like GIGI and THE SOUND OF MUSIC and I also like the Astaire-Rogers films, but usually I avoid musicals because they are either very stagy or there doesn't seem to be any reason for them to be singing in the first place. So keep this in mind when reading the review. The film is about a theatre in London that remained open throughout the Blitz. Because it is a dance hall, the singing and dancing that occur look like scaled-down versions of a Ziegfeld Follies show--exactly the sort of stagy musical I dislike. 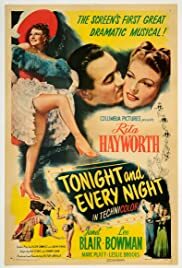 However, due to a nice romance between Rita Hayworth and Lee Bowman (though it does develop way too quickly) and a few good songs (particularly the emotional and heart-wrenching one at the conclusion), the film is an amiable time-passer. However, for fans of STAR WARS, I do recommend you see this film just for one musical number featuring Miss Hayworth. Towards the very beginning, she has her hair up in weird buns just like Princess Leia!!! So you can see where they got the inspiration for this awful doo!